Keep track of your installed applications in itopia. This article explains how to manage and restrict your apps for users. itopia's Applications module, when it comes to installing apps, works as a project management tool. 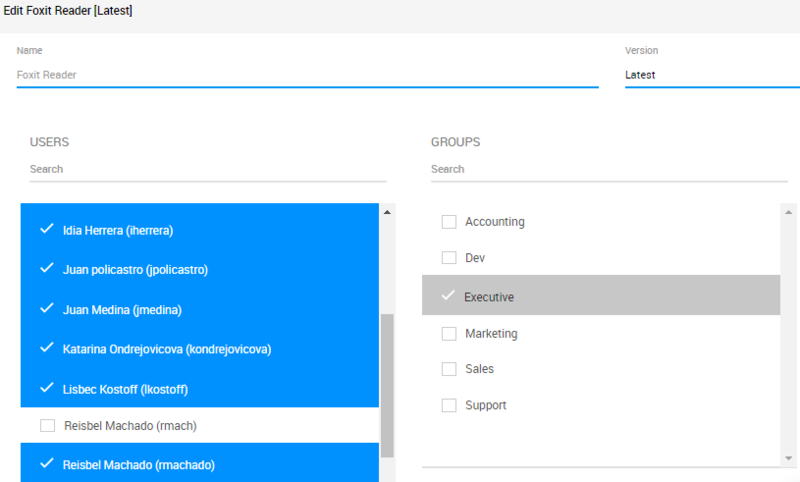 It means that it helps you to keep track of the installed applications, restrict them and when you add an application to the list, it will automatically create an installation task in itopia - Tasks section. To import apps from catalog to CAS go to Cloud Desktops - Applications and hover your mouse over the green + sign on the right. Select the option to import from catalog. Initially, your applications collected during discovery are saved in the Catalog section of the portal. 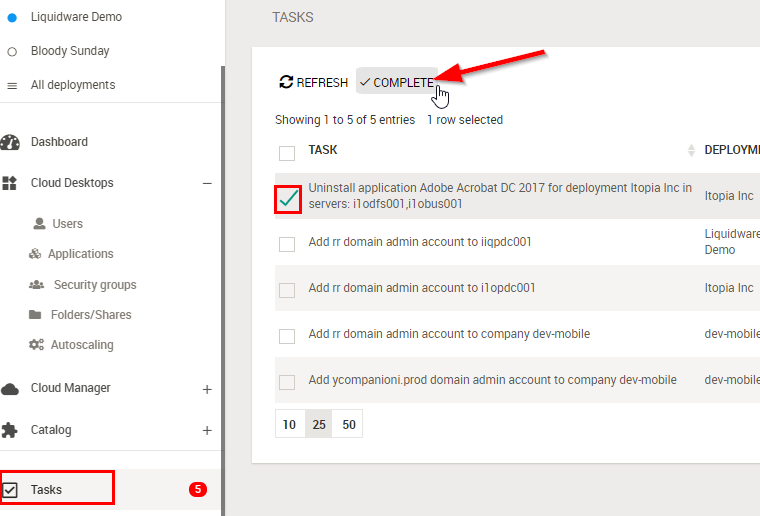 Once your deployment is on cloud, you can import them from the Catalog to create the installations tasks. To import the apps from the catalog Go to Workspaces - Applications and hover your mouse over the green + sign on the right. Select the option to import from catalog. Once done, the applications will be listed with the orange status as pending. You will have to install the application in the server manually. The system will create an installation task in Tasks section for every application you add so you can mark them complete as you install the apps in the servers. When you install the app and complete the installation task in the portal, the status of the application will change from Pending (orange) to Installed (blue) and you will be able to restrict the app (see below). IMPORTANT: Please note that all applications must be installed when connected in the session host server with domain admin credentials. Run these 2 commands: change user /install before starting the installation and change user /execute after the installation. By default, after installing an application, it will be available to all users. You can limit its availability assigning users to it and setting up a restriction. 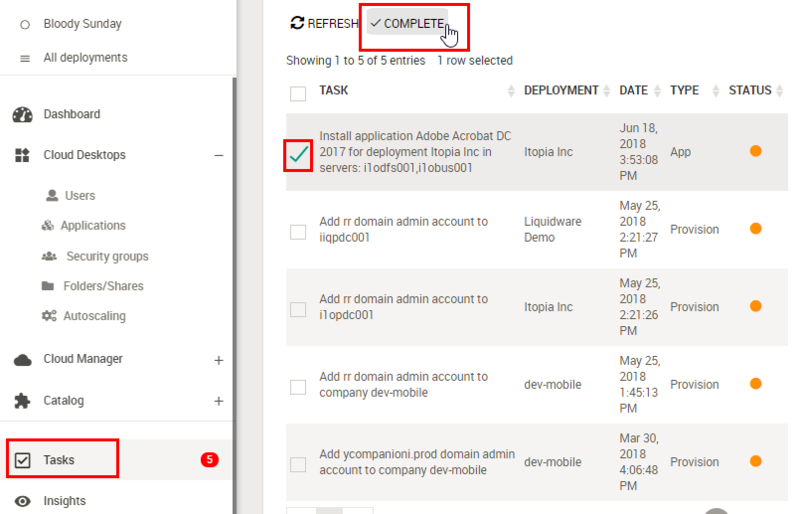 You can only restrict an application that is already installed in the server and if the installation task is marked as complete in the Tasks module. It will have a blue "Installed" status in the Applications section. Done! If the restriction is applied correctly, users that don't have access to the application will not have its shortcut on the desktop. A group policy is created that only allows users assigned to the application to open it. This is accomplished through a "Deny" group that contains all the users that are restricting from using the app. Note1: You can disable the restriction moving the slider back to the left and the app will not be restricted - it will be again available for all users. In case you have more than one version of the same application restricted, make sure that the name of the app in CAS portal and the name of the executable file are different for the correct functionality of the restriction feature. Note2: If a user that doesn't have access to the application receives a file in the same format as the application the user is restricted from (e.g. word, excel, pdf..), it will still relate the file with the app showing the correct icon but user will not be able to open the file. Connect to the server and uninstall the app. Make sure that you remove it from all the user session servers if there's more than one. Then go to the Tasks module and complete the uninstall task.